After trying both kinds of apples, this monkey is sticking with the red. It’s a tad sweet and totally snackable. 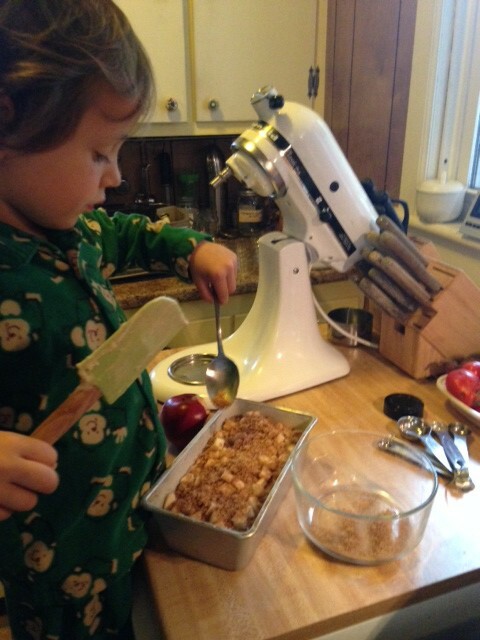 We made one loaf of bread, and from here on out, we’re making apple muffins. We used the yummy recipe found here. Mama substituted one cup of the flour with whole-wheat and all the sugar with brown, just because that’s how Mama does things. 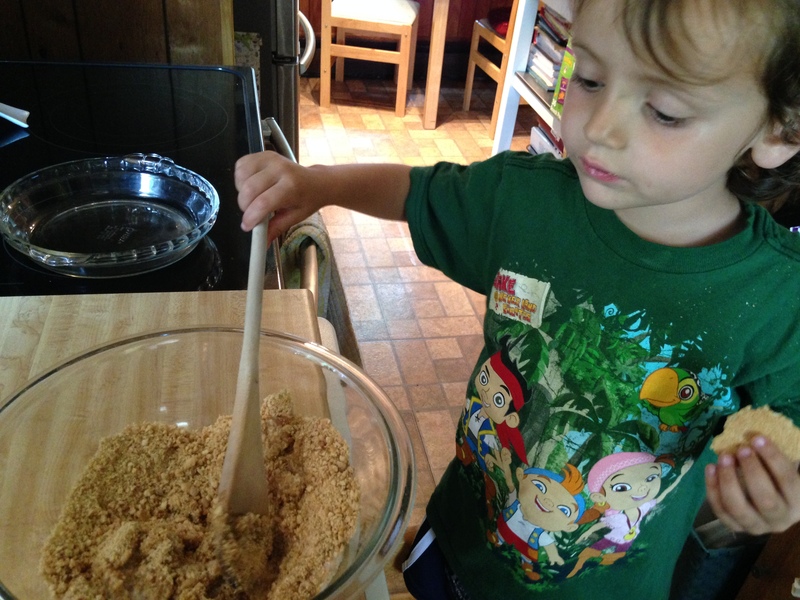 Then we put different sugar and butter in the mixing bowl and creamed them with the paddle. Mama told me to start slow, and I said “otherwise the dough will get angry.” What I meant was that it will fly all over the place. 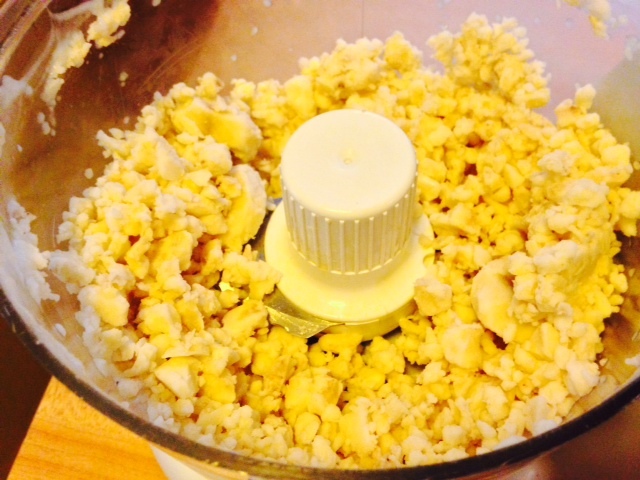 You’re not just combining the sugar and butter. What you’re doing is smashing the sugar into all that butter, coating all the little sugar granules with fat. This results in a lighter finished product with better lift. I’m holding the vanilla because I can’t wait to add it. I love it so much! Good thing Mama diced a large apple. Then we repeated the whole operation with a second layer. Mama advised me to spread out my additions as evenly as possible so there were no overly sweet or apply spots. I was eating batter with one hand and sprinkling cinnamon-sugar with the other. Talk about multitasking. Our bread took a bit more than an hour to bake until our tester came out clean. 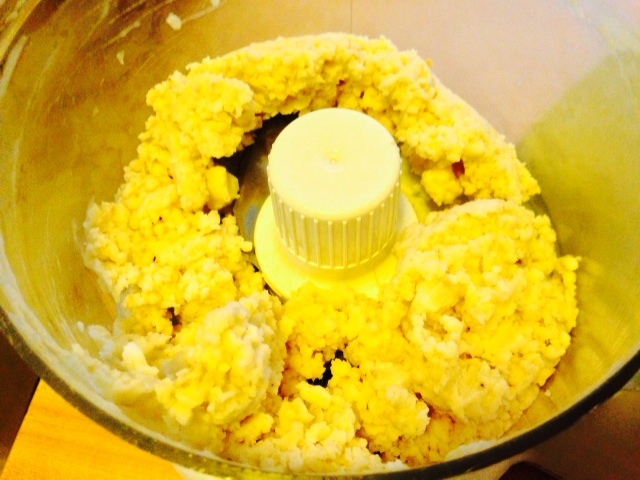 (When we made muffins a week later, the same amount of batter and fillings made 12 and baked for 20 minutes.) I declared this bread delicious. 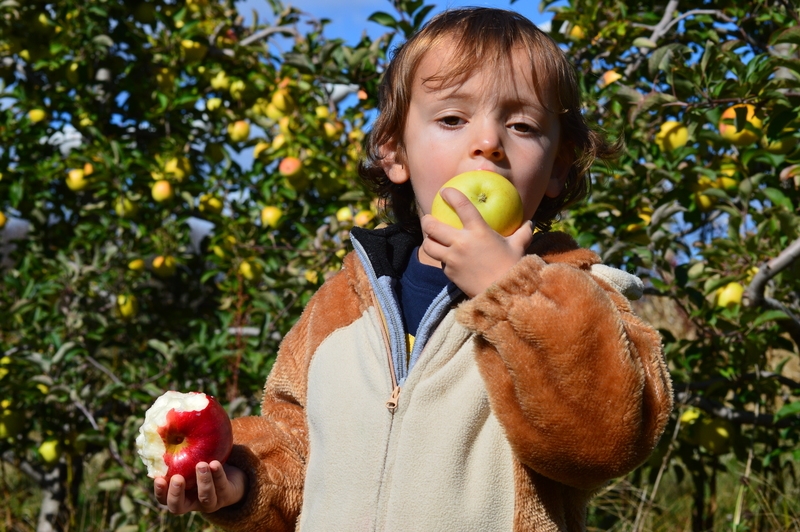 Good thing we picked lots of apples. We’re going to need them. Categories: Desserts, Hits | Tags: apples, cinnamon apple bread, cooking, cooking with toddlers | Permalink. 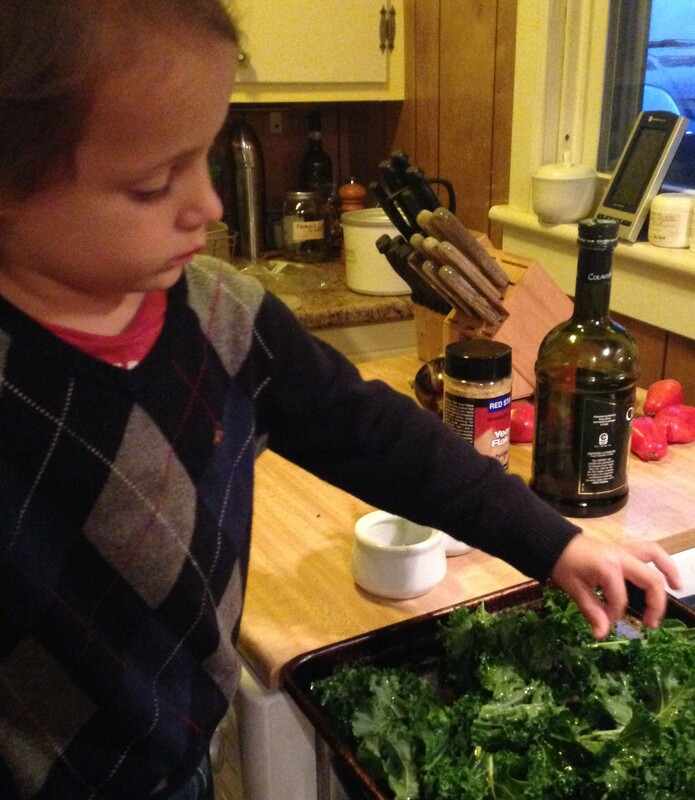 A little more than 2 years ago, I wrote about my love for kale chips. I’m happy to report that—unlike, say, pâté, beets, and orange foods—it’s a love I still embrace. Only now, because I’m such a big boy, I get to help make them. 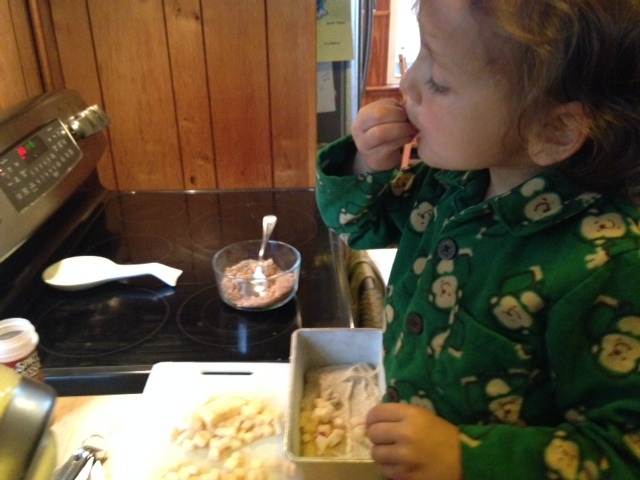 And clever Mama has upped the ante by introducing nutritional yeast into the mix. What I can tell you about nutritional yeast can fit on a kale chip. Suffice it to say that it is different from the yeast we’ve used to make bread and is most definitely not brewer’s yeast (even though the label might tell you otherwise). 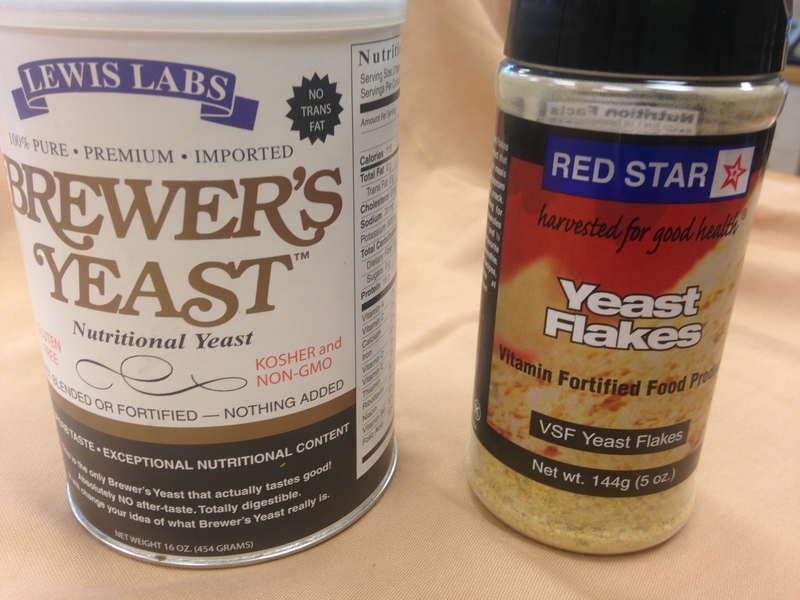 Nutritional yeast (often called “nooch” by those in the know) has a cheesy/nutty flavor (think: Parmesan), and what’s not to like about that? In addition to adding oomph to vegetarian dishes, it has a dose of B-vitamins as well as all the amino acids. Mama likes putting it on her eggs, but it’s similarly stellar in a tofu scramble or on popcorn. 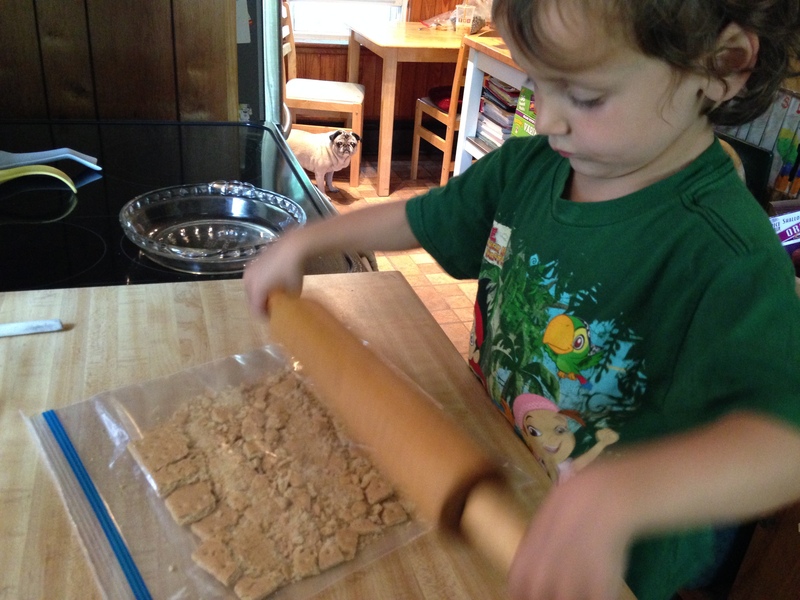 But don’t let my 4-year-old limitations hold you back from experimenting with nooch. If you make something yummy with it, let me know! Preheat oven to 300°F. Line a baking sheet with foil or just commit to cleaning your baking sheet when you’re done and go without. 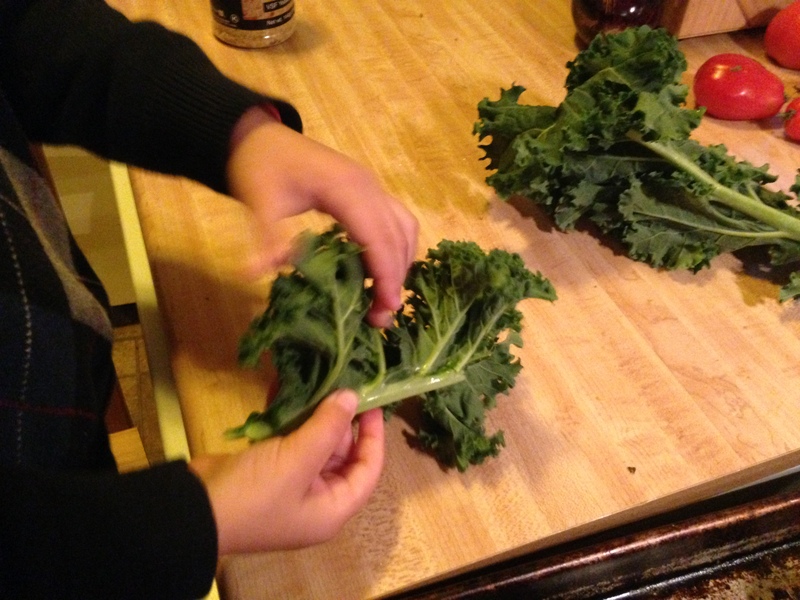 Rinse kale and rip the leaves from the center stalk. Mama suggested I pull the upward-growing leaves downward, so they tear off more easily, and it works! Try to make them of similar size because remember that the larger pieces won’t crisp up as much as the smaller ones. Tear the leaves downward away from the stalk. 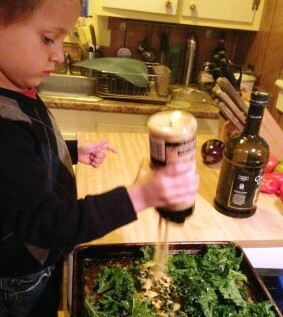 Scatter kale on baking sheet, then toss with about 1 Tbsp oil. You really don’t need a lot—it’s just so the salt and nutritional yeast has something to adhere to. We used kosher salt on our kale, but feel free to use sea salt, if that’s what you like. Maybe don’t let your kid pour on the nooch. Bake for about 15 minutes, until desired crispness. You could toss them once during baking, but you don’t have to. Enjoy immediately! 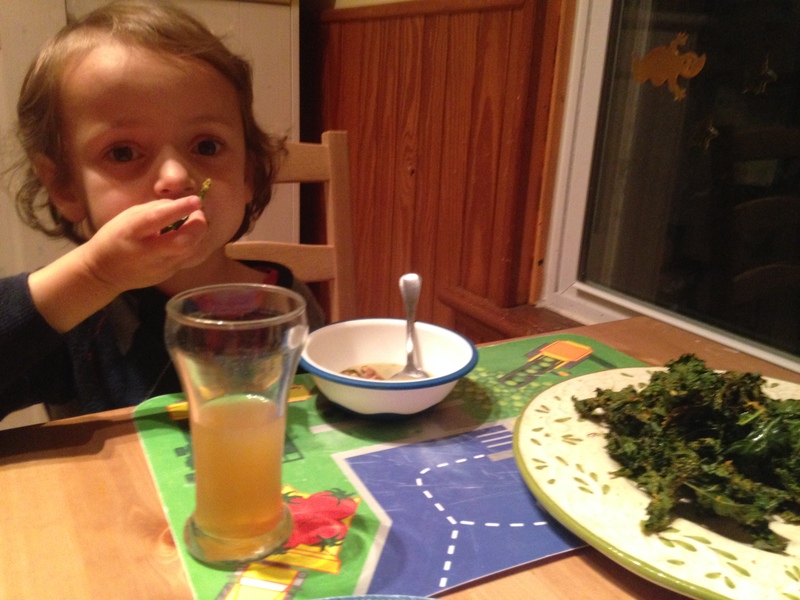 That’s a big plate of kale chips and a little bowl of soup. Categories: Breakfast, Hits, With recipe | Tags: baby food, cooking, cooking with toddlers, kale, nooch, nutritional yeast, recipe, Supercheesy Kale Chips, vegetarian | Permalink. 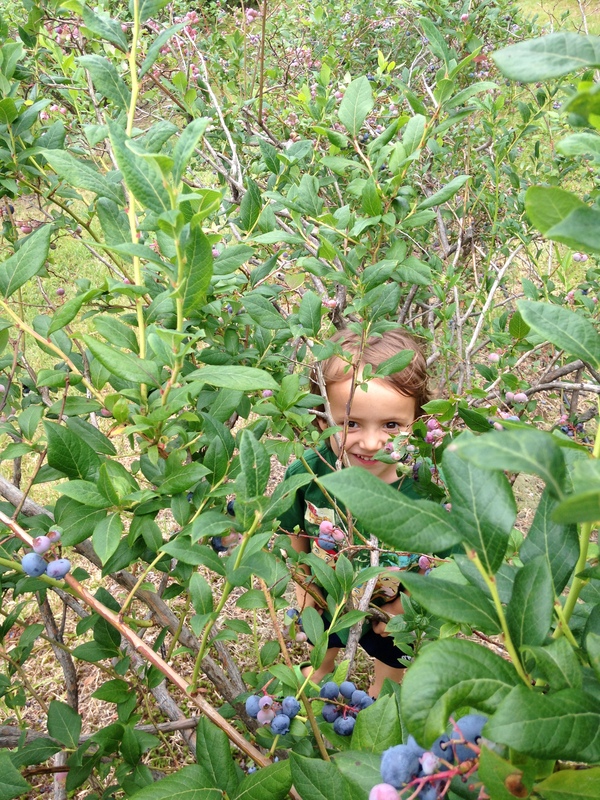 We’ve been fortunate to have a really long blueberry season this summer… then again, they started pretty late. And our two bushes never produced, so there’s that. Still, we went picking a bunch of times. 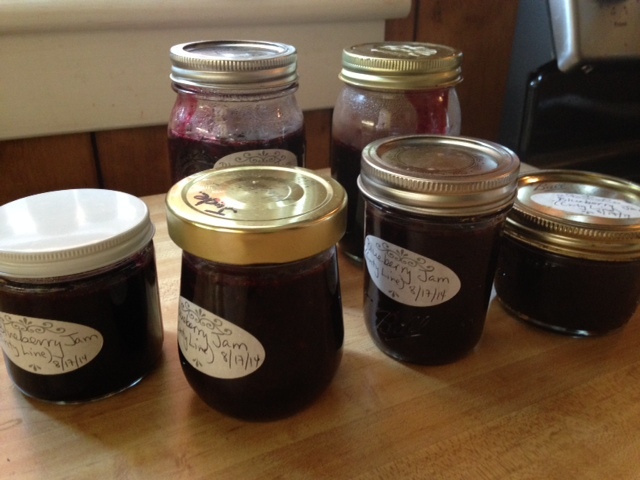 After Mama did all her sorting and freezing (and I did all my snacking), she made jam. Now, I like to say “jams and jellies” because that’s what Mr. Gru and Dr. Nefario say, but Mama tells me that they’re very different. 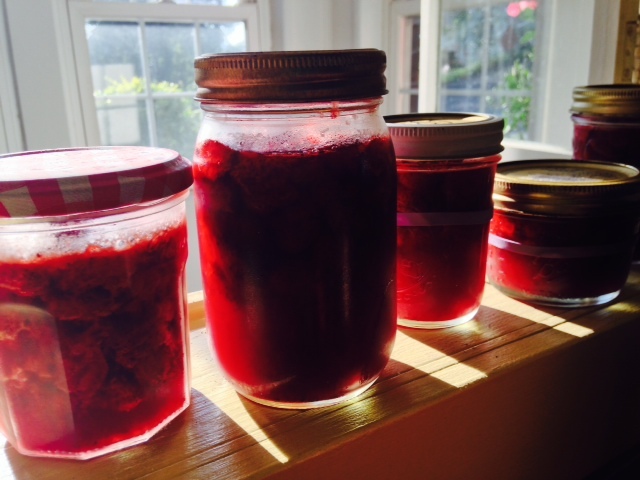 Jam is the cooked down, sugared, soft, and jelled version of fruits, whereas jelly is the jelled version of a fruit’s sweetened juices—that’s why it’s clear. And if you know one thing about us, it’s that we don’t have time to make jelly. The first thing to do is mash the berries. 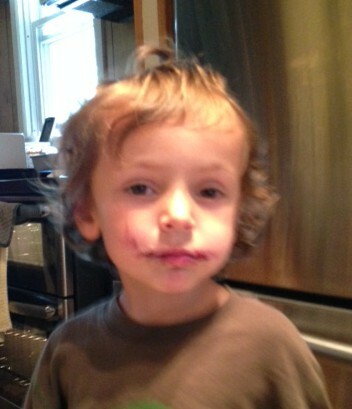 I would like to say that Mama let me do this, but the whole jam-making experience was more of an observation. 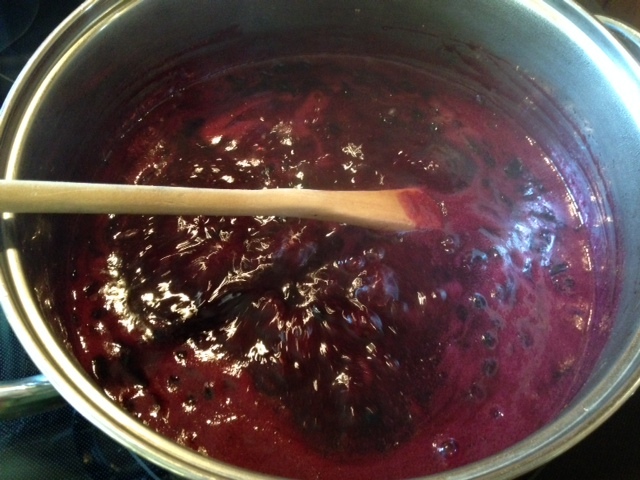 Blueberry mess + boiling sugar syrup = imminent danger in this household. Once the berries were mashed, they were cooked with some water, local honey (Mama thought she’d change it up a bit), lemon juice, spices—cinnamon and cardamom, to be exact—and a dash of good ol’ pectin, to help it set up. 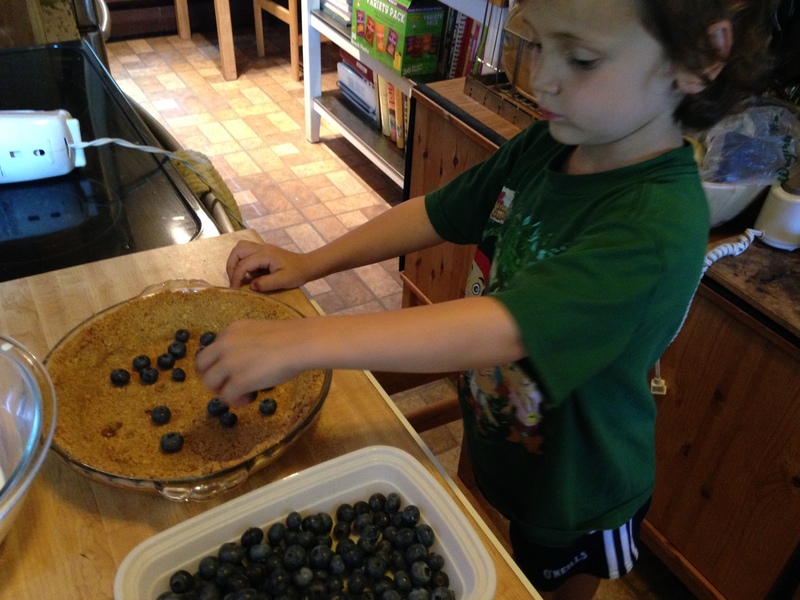 When we’re making a quick on-the-spot jam, Mama skips the pectin, but as blueberries don’t have a lot of it on their own, she opted for the help. Pectin also needs a bit of acid to do its magic, hence the lemon juice (that, and blueberries and lemons are just plain yummy together). Either way, the simple test to see whether the jam is sufficiently jelled is by putting a dab of it on a plate that’s been in the freezer. Return it to the freezer, and if, when you take it out and run your finger through it, it seems jammy, you’re done! If not, return the jam to a boil and cook it down a little more. Mama decided to store this jam in the freezer (mainly so she didn’t have to haul out her canning equipment), so she put it in a bunch of pretty little jars instead and called it a day. Once cooled, she carted the jars to the freezer and found a cozy place for them. And the very next day, I made myself a yummy blueberry jam and peanut butter sandwich. Mama says I look like the Joker, whoever that is. I say this face looks like summer. Categories: Desserts, Hits | Tags: baby food, blueberry jam, cooking, cooking with toddlers, pectin | Permalink. 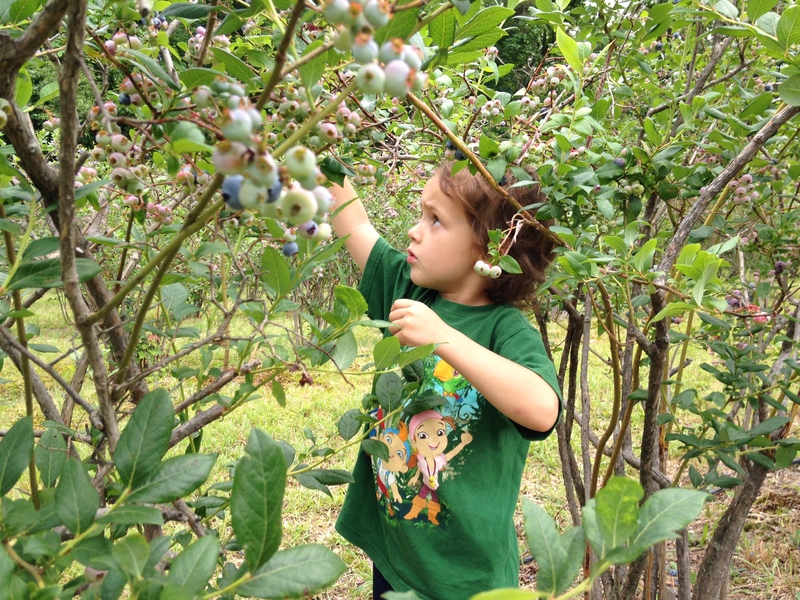 Yesterday, Mama and I went blueberry picking. I told everyone we met that we were going to make blueberry pie and blueberry jam. Soon after Mama stuck a bunch in the freezer (remember to freeze on a tray before putting them into bags! 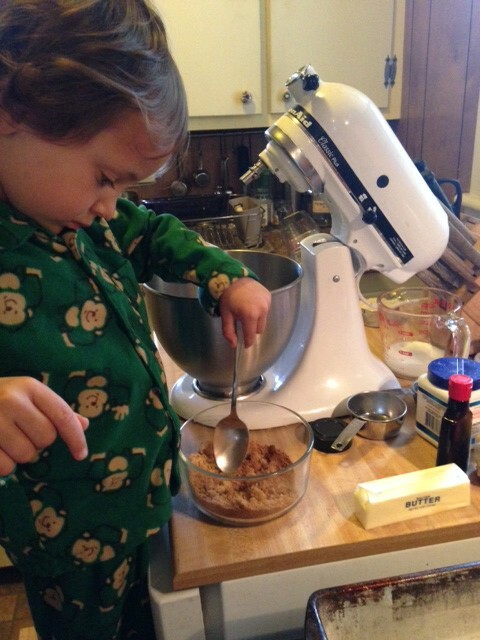 ), we set to work on making that pie. 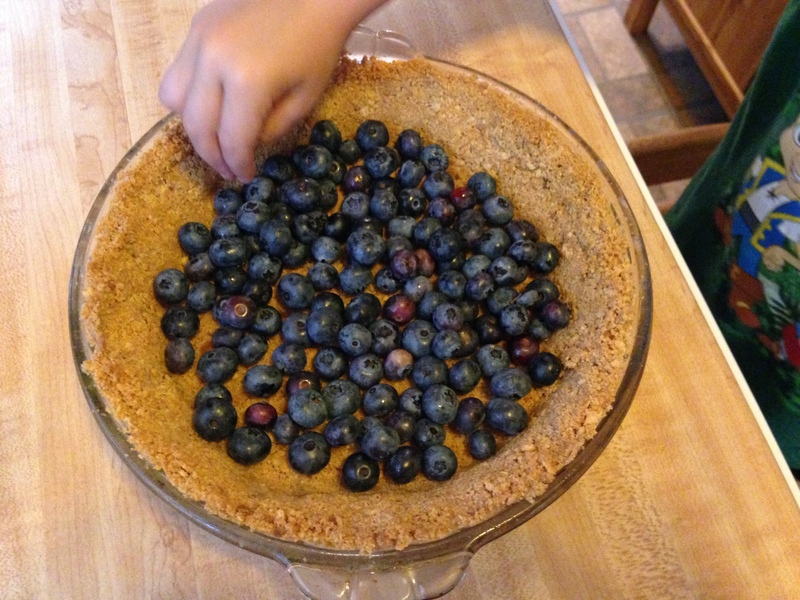 We’ve made all kinds of pies before, and I thought we might make a Bluecherry Pie or a crumble, but Mama wanted to show me how to make a pie that’s both fast and doesn’t require an oven. 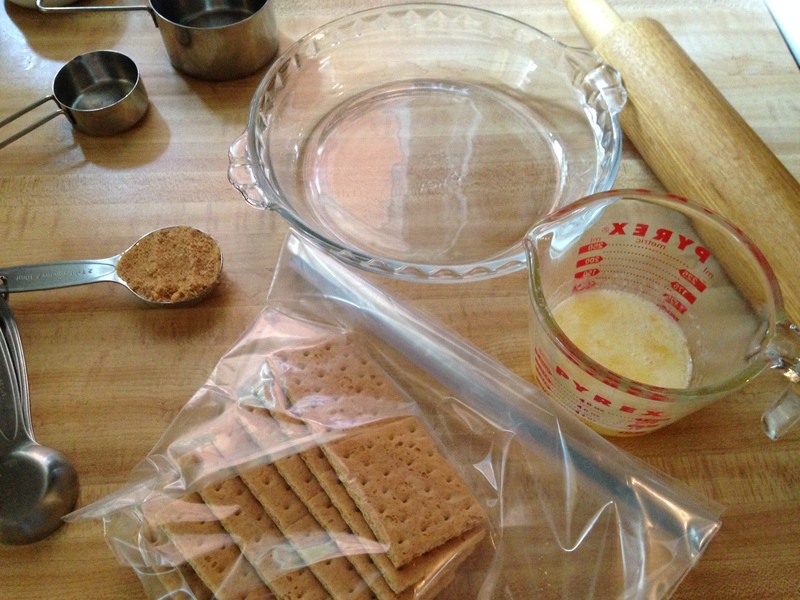 Just graham crackers, melted butter, and a bit of brown sugar is all you need to put together a crust. This is a GREAT activity for a kid like me. I got to eat the extra graham cracker. Mama pressed the crumbs into the pie plate. (I didn’t want to touch it.) 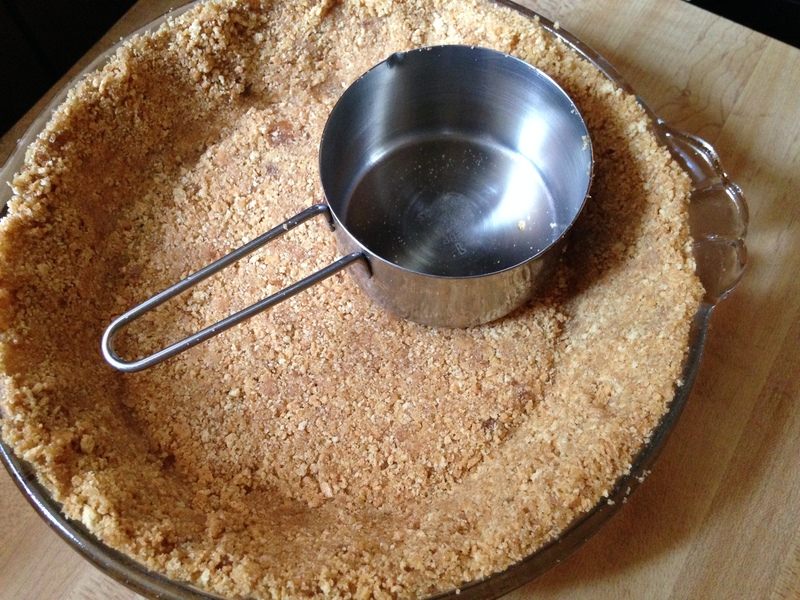 You should use your hands, but to help press it firmly into the edges and up the sides, use a measuring cup or glass. For the filling, Mama let me whip the cream. (Remember how to make chantilly?) Then she made sort of the same thing, but with cream cheese. This is my preferred method of cleaning beaters. Fold the two together, add some lemon zest, and you have your filling. 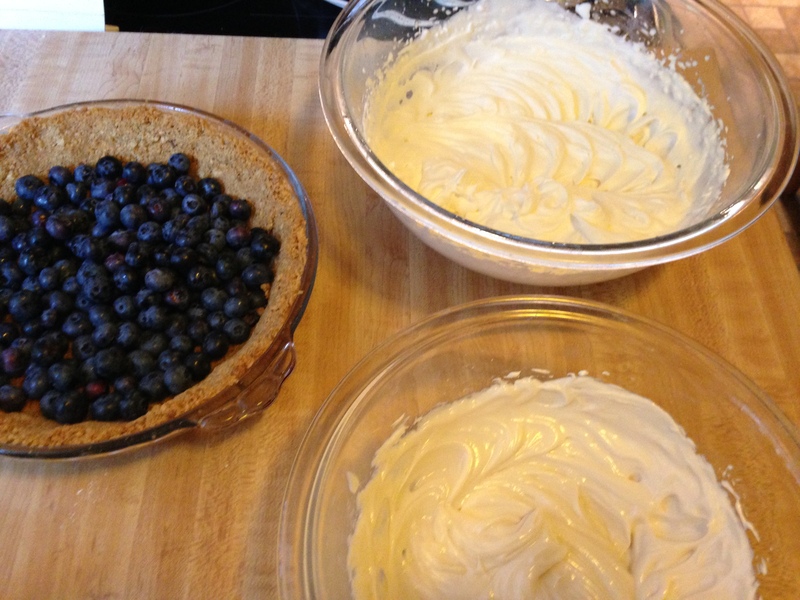 Carefully spoon the creamy mixture over the berries, and now you have pie! I have to say that this is the easiest pie I’ve made. 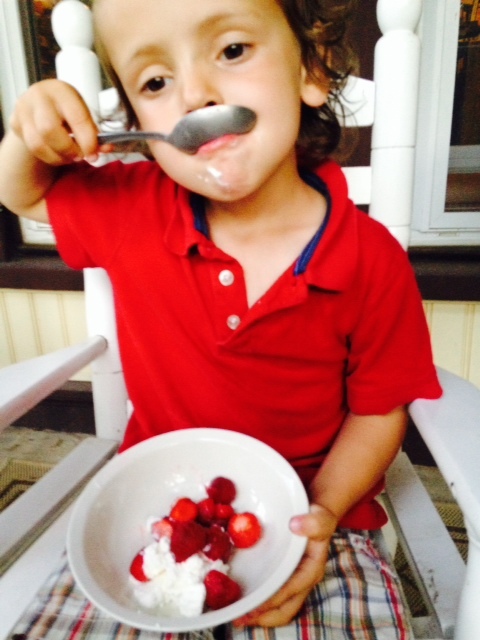 And Mama let me have a small piece for breakfast today…just before we had our blueberry pancakes. 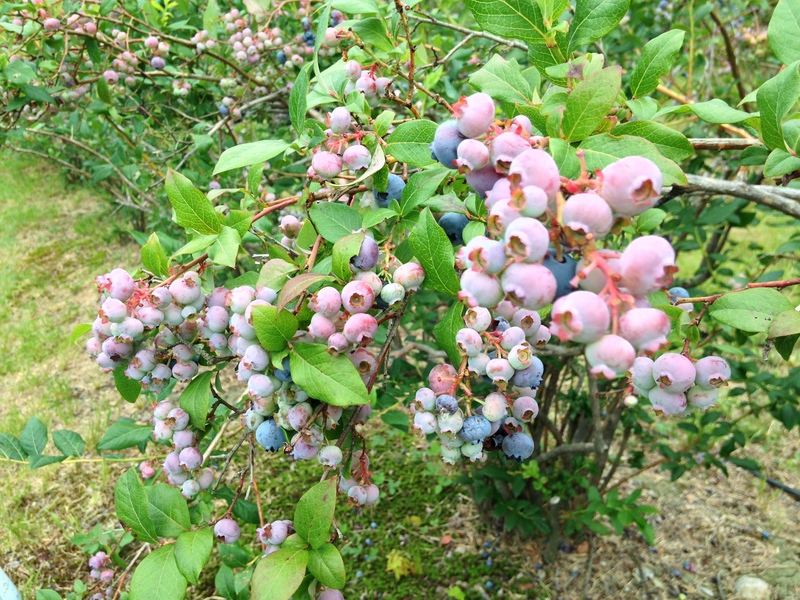 I love blueberry season! 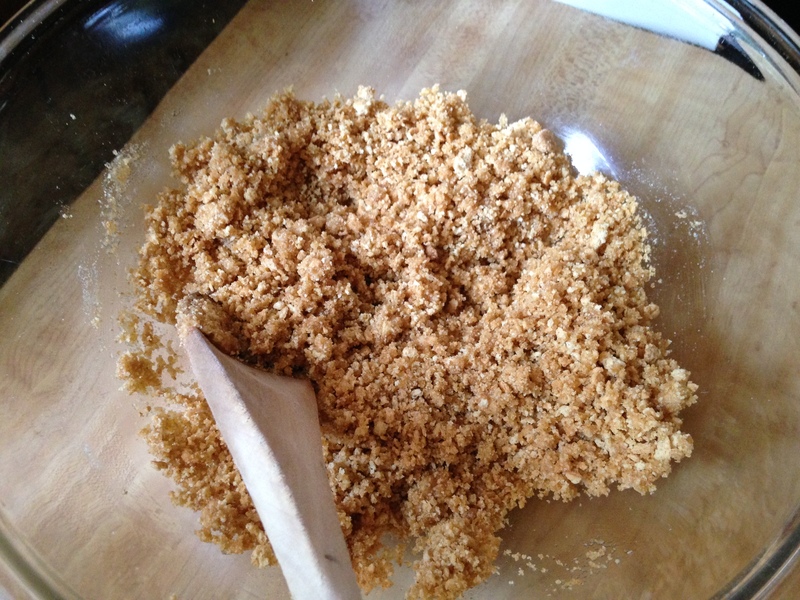 Mix together the crumbs, butter, and brown sugar until uniformly moist. Firmly press into a 9″ pie plate. Chill for 1 hour or bake at 325°F for 10 minutes; cool before proceeding. 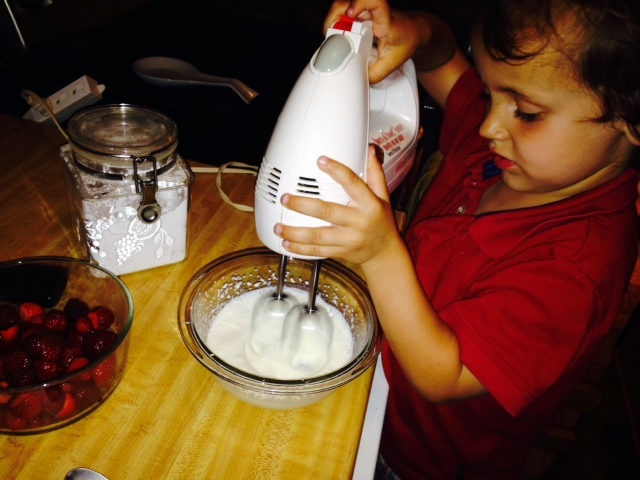 Use a hand mixer to beat the heavy cream, 1.5-2 tbsp powdered sugar, and a splash of vanilla until stiff peaks. Taste and adjust flavorings, if desired. In a separate bowl, beat the cream cheese, 1/2 cup powdered sugar, and a healthy splash of vanilla until smooth. 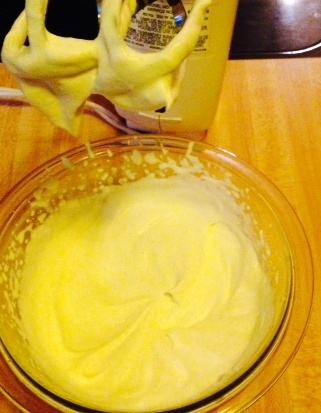 Stir in the lemon zest, then fold the whipped cream into the cream cheese. Scatter the blueberries over the bottom of the chilled or baked-and-cooled crust. 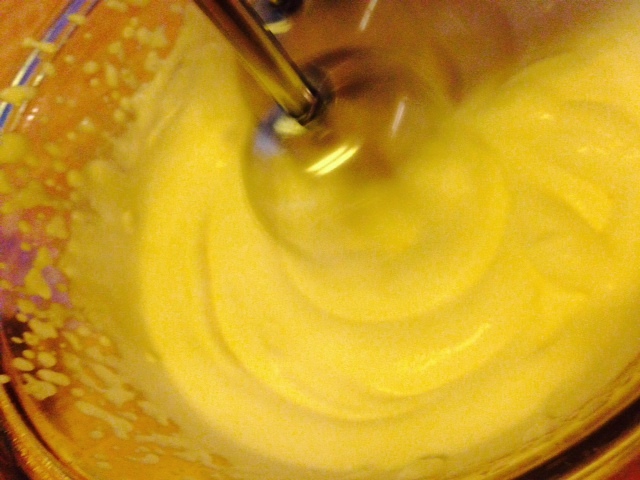 Carefully spoon the cream mixture over top. Garnish with berries, lemon curls, mint, etc. Keep refrigerated until ready to serve. 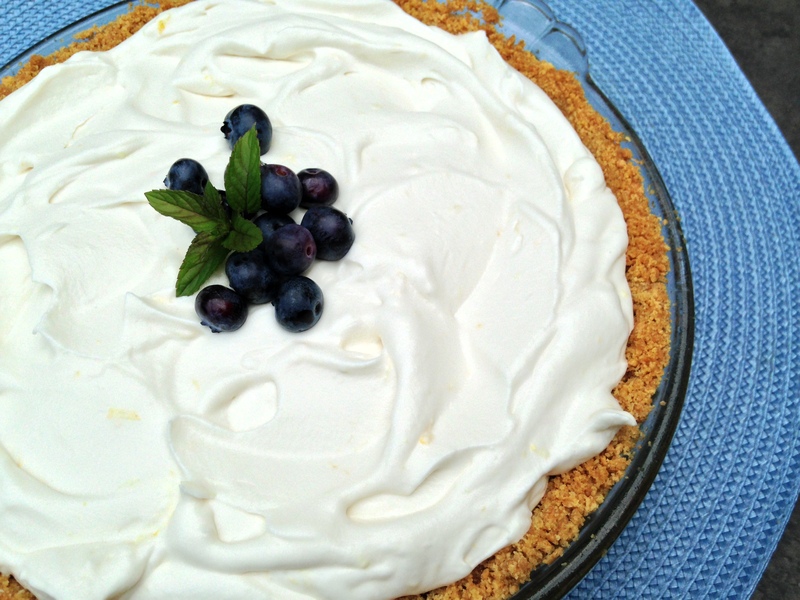 Categories: Desserts, Hits, Pie, Uncategorized, With recipe | Tags: blueberries, blueberry pie, cream cheese, graham cracker crust, No-Bake Blueberries & Cream Pie, no-bake pie, whipped cream | Permalink. In honor of Bastille Day (and Papa’s return from Paris), Mama decided to make a quiche. She opted for crustless, as who has time to make and pre-bake a crust on a hot summer’s evening? Because I like broccoli (and because we had a bunch of it), she figured a broccoli and cheese quiche would be just the thing. 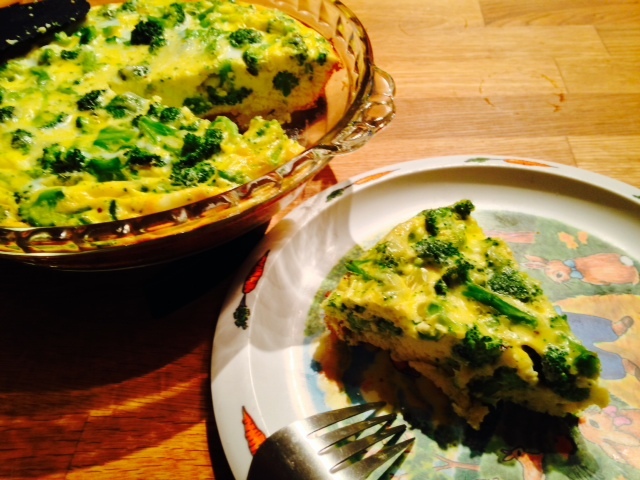 Of course she tried calling it an “egg pie” and a “broccoli pie,” which only made matters worse. After much cajoling, I finally tried a tentative bite. You can imagine what followed. I knew from first sight that I wouldn’t like this. Preheat oven to 350°F. Grease a 9” pie plate. (We used butter, as it’s a French dish, after all.) Boil or steam the broccoli until bright green and crisp tender, about 1 minute. Drain and set aside. Jude on Food: All ingredients that go into a quiche should be cooked. In a medium bowl, whisk the eggs until broken up and well combined. Add the cream or half-and-half and whisk to combine. Stir in the blanched broccoli and cheese. Season with salt, pepper, and nutmeg. Gently pour into prepared pie plate and bake until set & puffy, about 30 minutes. Allow to cool about 5 minutes before cutting and serving. Categories: Dinner, Misses, Vegetables, With recipe | Tags: baby food, broccoli, Broccoli & Cheese Quiche, cheese, cooking, cooking with toddlers, eggs, no-crust quiche, recipe, vegetarian | Permalink. I didn’t like picking these strawberries because it was too much work hunting for them. I kept asking Mama to add her berries into my basket. 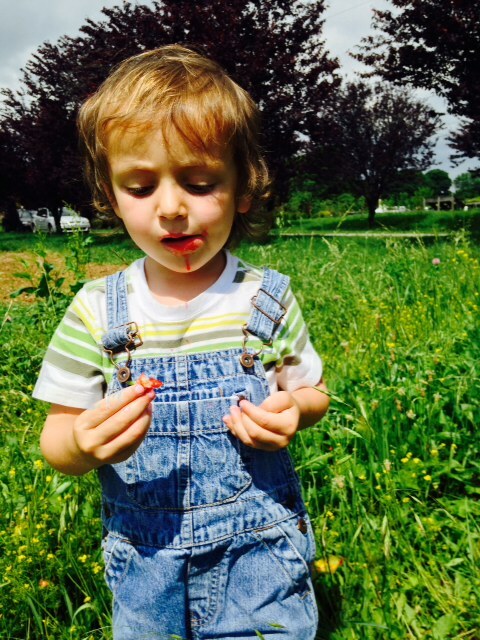 But the berries were warmed by the sun, and they positively burst when I bit into them. At home, Mama ended up doing all the cleaning, but I helped her by eating a lot of those strawberries so that there were fewer of them for her to clean. 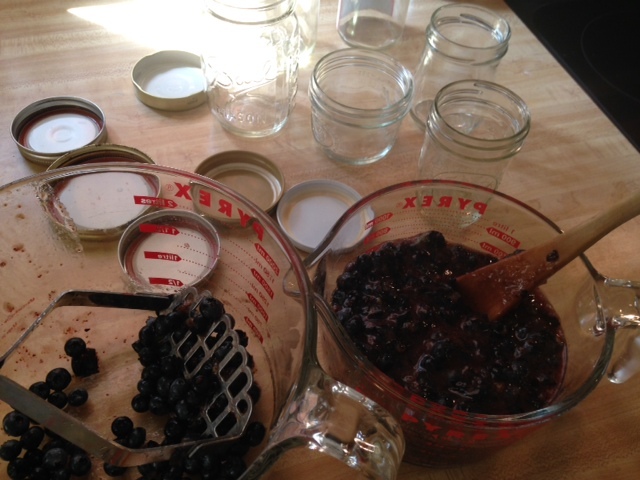 Though all the jars ended up sealing, we’re going to store them in the fridge & freezer. But the real show stopper, the easiest and most delicious part, was the fresh berries with whipped cream we ate for dessert. Mama says anyone with a whisk can whip cream, but not everyone does it correctly. She showed me how to do it right. 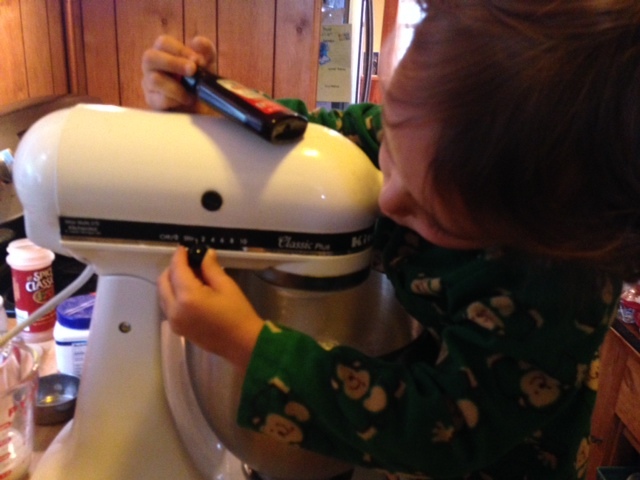 Mama explained that the only cream that’s going to whip is heavy cream, or whipping cream (either one will work). 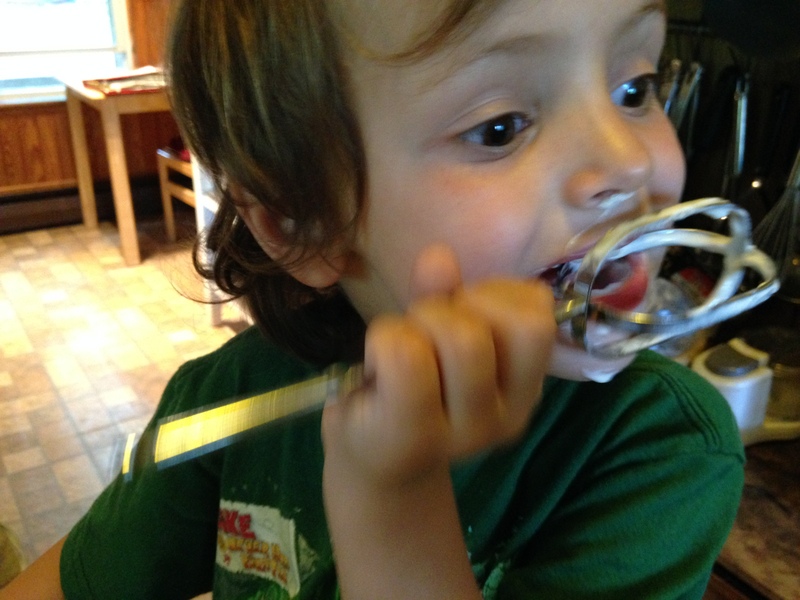 If you try to whip light cream or half-and-half, you’ll be whipping until I turn 4. This is because of the fat content (the fat is what holds it together). 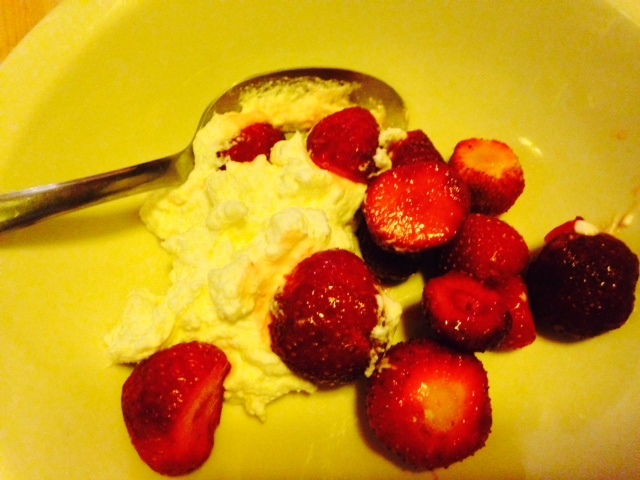 She also explained that plain whipped cream tastes about as bland as… well, plain whipping cream. Bleck. 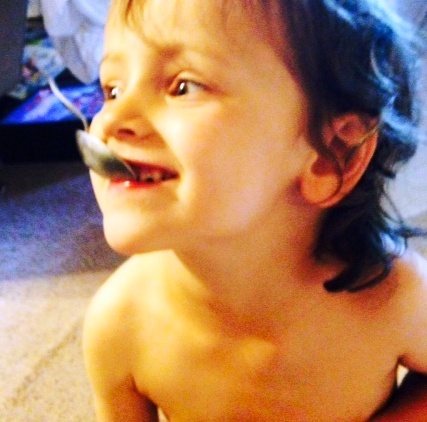 Jude on Food: Flavor everything! To remedy this, Mama showed me how to make chantilly cream. If you’re feeling fancy, you can pronounce it “shahn-tee-ee,” but I’m really good at making “L” sounds, so I’m going to stick with that. Chantilly is basically sweetened whipped cream with added vanilla. Two other things Mama noted about making whipped cream: 1) go slowly—if you rush it by turning your mixer on high speed, you’ll not only splatter cream everywhere (as I found out), but you’ll heat up the cream, and it’ll take longer. 2) Don’t overwhip it. 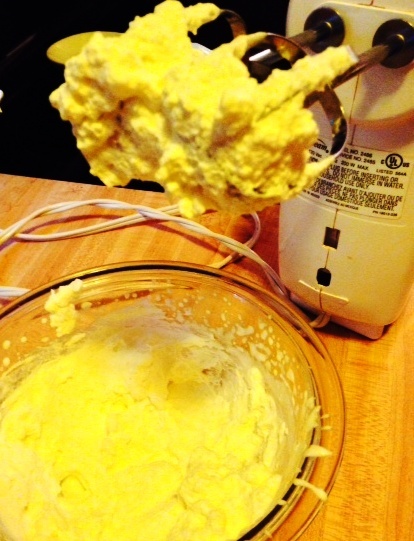 Whip it–whip it real good! The problem with overwhipping cream isn’t the taste. It’s the texture. Even I don’t want my whipped cream to look like cottage cheese. Ewww, right? You can whip it to soft peaks or stiff peaks, but if you go beyond that, you can’t do much with it…except, maybe stuff it into something. Who am I kidding? I’d still eat that. See the trails that are created by the beaters? They’re loosely holding their shape, but they’re still very soft. Another way to tell when the cream is getting close is to stop beating it and check how it looks on the beater. The whipped cream is just clinging to the beaters, and there’s a soft little peak down in the bowl. From here to ruin is a short path, so beat carefully from now on. If you’re planning to pipe the cream, you’ll want stiffer peaks, as they’ll hold their shape. If you’re looking for just a bit of billowy adornment, as we want for our berries, then stop when they’re soft. Stiff cream will hold in the fridge, covered, for a day or so. Soft cream should be used pretty soon after it’s made. If it starts to weep, give it a light whipping with a whisk before using. And what’s not to like about having a little whipped cream on hand? Place cream, sugar, and vanilla in a medium bowl and beat at low speed with an electric mixer (or in the bowl of a stand mixer with whip attachment); alternatively, use a whisk. 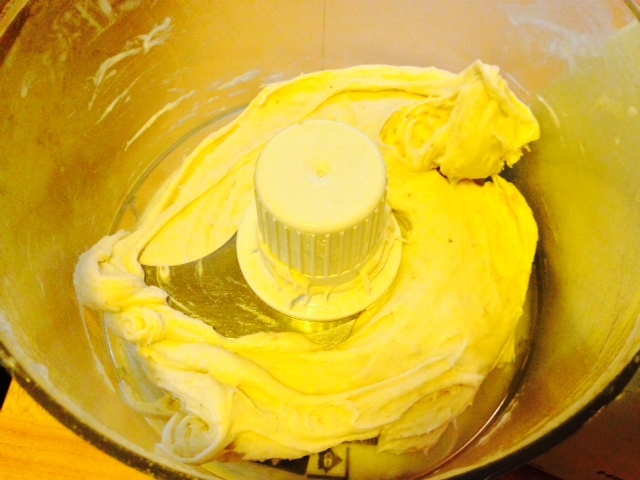 When the cream begins to take shape, you may increase your speed a little bit more, but not more than medium. Move the beaters around the bowl and rotate the bowl to ensure you reach all the edges. Beat until desired stiffness, then serve or store until ready to use. This dessert is Mama approved AND Jude approved. Note: For an extra-special treat, try whipping crème fraiche. As sour cream’s sophisticated (and more pricey) cousin, it’s tangy and makes for a great complement to lemon curd and supersweet berries. For a vegan alternative, put a can of full-fat coconut milk in the fridge overnight. Without shaking it, take it out of the fridge, remove the lid, and scoop out the solid white part. (Reserve the watery portion for smoothies.) Whip & flavor the white solids like you would cream. Categories: Desserts, Hits, With recipe | Tags: baby food, chantilly cream, coconut whipped cream, cooking, cooking with toddlers, David Lebovitz, dessert, jam, recipe, strawberries, vegan cream, whipped cream | Permalink. You know me well enough by now to understand my ice cream obsession. So I was thrilled when she offered to make banana ice cream with me, and not the kind that takes all day, what with the heating and the straining and the cooling and the freezing. Sneaky Mama planned it in advance. First, she sliced 2 bananas, then put the plate in the freezer. I didn’t know what was up her sleeve when she did this, so the wait didn’t bother me. Then she put the frozen slices in the food processor and began chopping them up. It was really loud, and I didn’t see how this was going to turn into ice cream. It was smooth and creamy—and cold! Though it looks quite yellow in these pictures, it was actually closer to vanilla in color. And best of all, it was so easy (and so good for me) that Mama promised that we can make it all summer long. And that makes me about the happiest kid on the block. 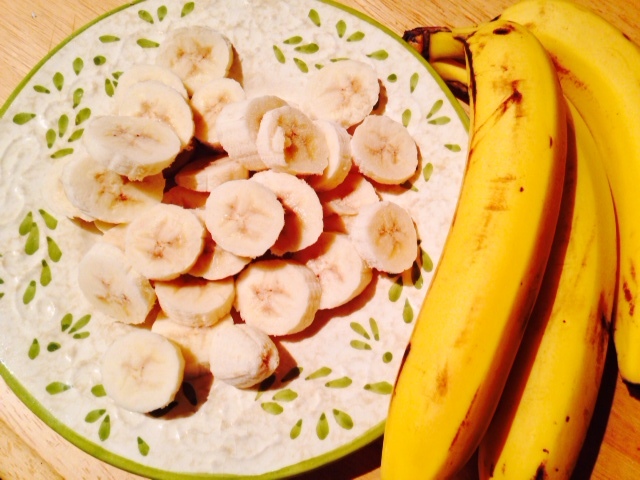 Categories: Desserts, Hits | Tags: banana ice cream, cooking, cooking with toddlers, frozen bananas | Permalink.